The practice, known in the wireless industry as cramming, allegedly involved AT&T billing its customers hundreds of millions of dollars over several years for which they kept at least 35 percent of. Many of the fees came in the form of $9.99 recurring charges that the customer may or may not have been aware of. 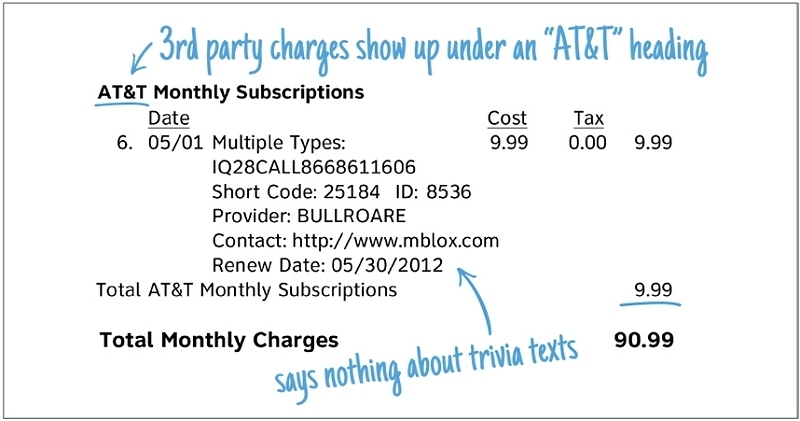 AT&T did note the charges on billing statements although they were often extremely vague, such as “Variety Texts.” AT&T fielded 1.3 million calls on the matter in 2011 from customers that noticed the extra charges although they often had a tough time getting the wireless carrier to refund them. Sometimes, they were only willing to refund a month or two at best. As part of the settlement, $80 million will be used to provide refunds to affected customers. An additional $20 million will go to the 50 US states and the District of Columbia while the remaining $5 million will be pocketed by the FCC. In addition to the monetary damages, AT&T is being forced to end such practices and will have to proactively notify subscribers in the event extra fees are added to their accounts. Consumers that believe AT&T unlawfully charged them for such services are encouraged to submit a refund claim. All claims must be submitted by May 1, 2015.